The Anne T. and Robert M. Bass Professor of Government, at Harvard University, in Cambridge, MA, Michael Sandel (1953-), says a former student, "smiles easily and thinks deeply." His most recent book, "Public Philosophy: essays on morality in politics," is published by Harvard University Press. In a sense, Dr. Sandel argues for a civil society that puts rights first in the hope good follows. Dr. Sandel argues social good naturally flows from social rights. He's thus labeled a "communitarian" by some. Generally, a communitarian emphasizes ascribed social characteristics, such as family, tradition and the content of moral reasoning; the social construction or ontology of reality and the normative importance or superiority of the group. As a result, Sandel furthers the dialectic of the self and society, in favour of a form of the self, often focusing on the dangerous effects of Wal-Mart and the McDonalization of society on core groups, such as the family or the community. 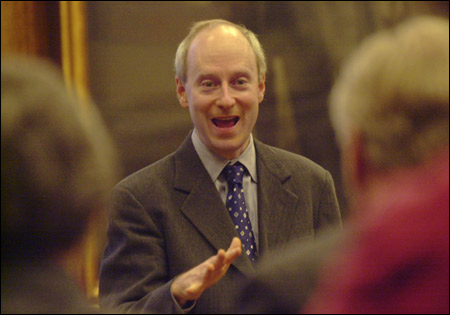 For the past 20 or so years, Sandel has taught the highly-subscribed, "Justice" course, at Harvard. "Justice" is the only moral philosophy and reasoning class taken by most Harvard students. During the fall of 2006 enrolment in "Justice" exceeded 1,000 students. For these reasons, if not the veracity of his thought, Sandel is singularly influential. Although the work of Dr. Sandel stands, strong, on it's own merit, it began as a response to "A Theory of Justice," by Dr. John Rawls. Sandel is best read and understood in this context. Click here for a brief overview of the core ideas of Rawls, and an even briefer comment on Sandel and Rawls from the perspective of another discipline.